Over the last year, the North Carolina Museum of Art has been documenting the design process we’ve been using in our IMLS planning grant on the role of museums in next-generation learning. On Saturday, January 30, 2016 (after a week’s delay due to weather), we held a Thought Partner Summit for our two advisory panels and a Future of Learning panel discussion for the public to reflect on the work we’ve done so far and prepare for the final stretch of our grant. In the morning, our collaborative planning team of P-16 educators from across the state met with three out of the nine thought partners (the other six were not able to attend the rescheduled event). These thought partners are national leaders in the fields of education, museums, and technology. Working in affinity groups, they shared ideas about teacher professional development, experiences for students that happen online and onsite, and participatory gallery spaces. Thought Partners helped groups become aware of potential models for programs, recognize gaps in our planning, and find connections between prototype ideas. We then invited the public to join the discourse in a lively panel discussion that afternoon (#NCMAfuturelearn) investigating the future of learning and the role of the art museum in shaping and supporting that future. Sylvea Hollis, from the Center for Future of Museums, moderated a panel featuring Corey Madden, executive director of the Thomas S. Kenan Institute for the Arts; Matthew Rascoff, Vice President of Learning Technology and Innovation at the University of North Carolina; and Dr. Keith Sawyer, Morgan Professor of Educational Innovation at UNC-Chapel Hill. The full panel discussion recording is linked here through Livestream. Here are three (of many) big takeaways from the panel that help us take a closer look at what the future of learning might look like and what role museums might play in that future. The environment in which people learn can have a huge effect on how they learn, what they learn, the questions they ask, the ideas they generate and so on. Corey Madden used her combined experience as a leader at Kenan Institute for the Arts and a practicing artist to think about how spaces can help shape a learner’s perspective and develop new ideas. But what if that space is virtual? Physical? A hybrid? What are opportunities in person that are not possible online, and vice versa? During the Q&A portion of the panel, a student in the audience who is also a member of the NCMA Teen Arts Council, shared her experience with a teacher who made learning AP Calculus engaging, creative, and relevant to her. Matthew Rascoff predicts two categories of technology that will have the biggest impact on the future of education. The first, that he believes is “years off,” is incorporating adaptive learning into education. In this scenario, computers understand the learner’s patterns, make sense of those patterns, and then tailor the experience to exactly what the learner needs at that time. The second category of edtech which is not years off, but in fact happening right now and will continue to do so, is “using technology as an enabler of better connections among and between people.” It can foster communities of learning so anyone can access and benefit from knowledge about a topic. For example, the Brooklyn ASK app connects curators to the general public in real time. As visitors have questions about an object, they can connect with an expert to share insight and answer their questions. Echoing Corey’s point earlier – learners can use technology to enhance the human experience and desire for learning. This discussion was interesting because it focused on themes, ideas, and projections for education as a whole and never got stuck in talking about one ‘type’ of education. In the quotes above and throughout the event, the panelists use the terms ‘educators’ and ‘learners’ interchangeably with ‘student’ and ‘teacher.’ This change in language is one step in the right direction to breaking down silos between educational institutions and organizations. 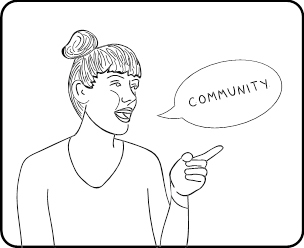 The takeaways are applicable to myriad learning spaces, whether they’re on a college campus, in a museum, community center, or even senior center. 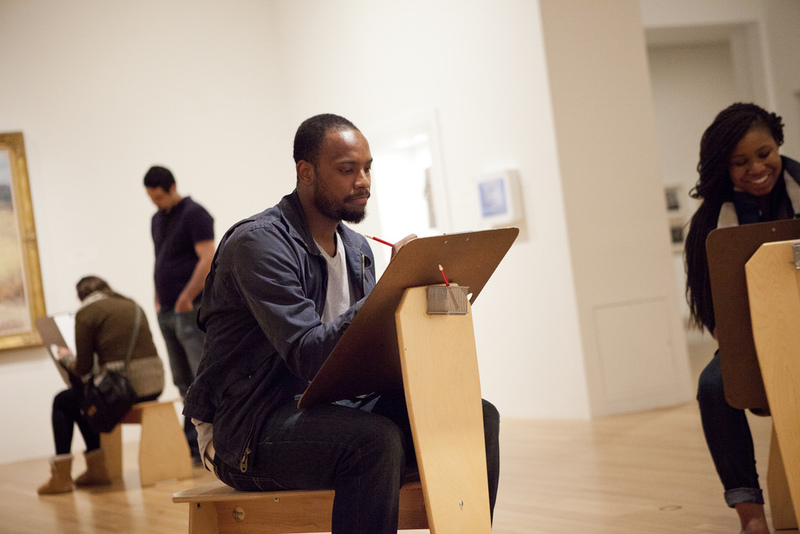 Please share your feedback, comments, or responses on how museums are integral to the future of learning. Focus for a moment on an object in front of you. How do you understand its shape? 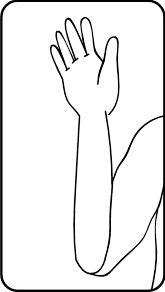 How would you represent it by drawing it? Imagine turning or rotating it. What would it look like then? How could you create something with the same shape? You’ve just utilized spatial intelligence, your capacity to analyze and transform visual and mental imagery in two and three dimensions. This capacity is fundamental to both math and art, and a has been found to be a key indicator in students’ long-term academic and professional success. 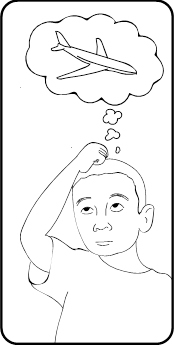 A growing body of research in educational psychology and cognitive science is looking at ways to enhance spatial intelligence, such as a recent study which showed that spatial training improves 6-7 year old children’s math calculation. 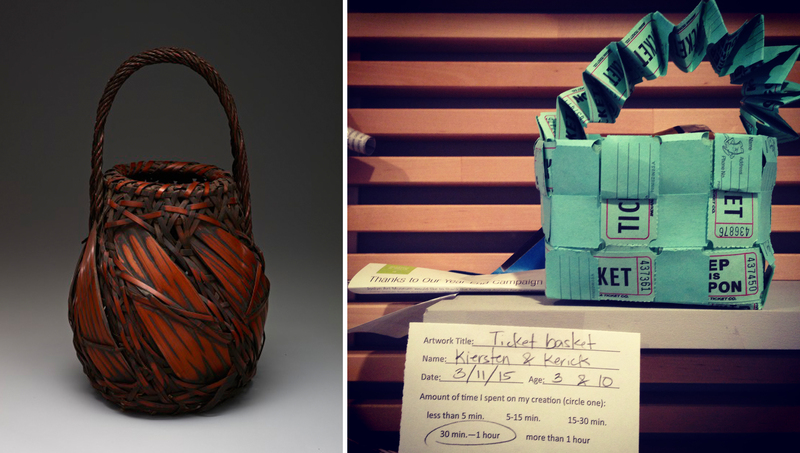 When we look at and create art, we are exercising spatial intelligence to analyze and construct objects and images. Rich experiences with works of art have been shown to significantly enhance student math achievement, as documented by the Framing Student Success program that studied the effects of standards-based instruction that integrated high-quality visual arts, math, and literacy content in three high-poverty New York City Public Schools. These findings support a growing trend in K-12 programs across the country to merge arts instruction with science, technology, engineering and math (STEM) education, pioneered by Rhode Island School of Design’s STEM to STEAM initiative. 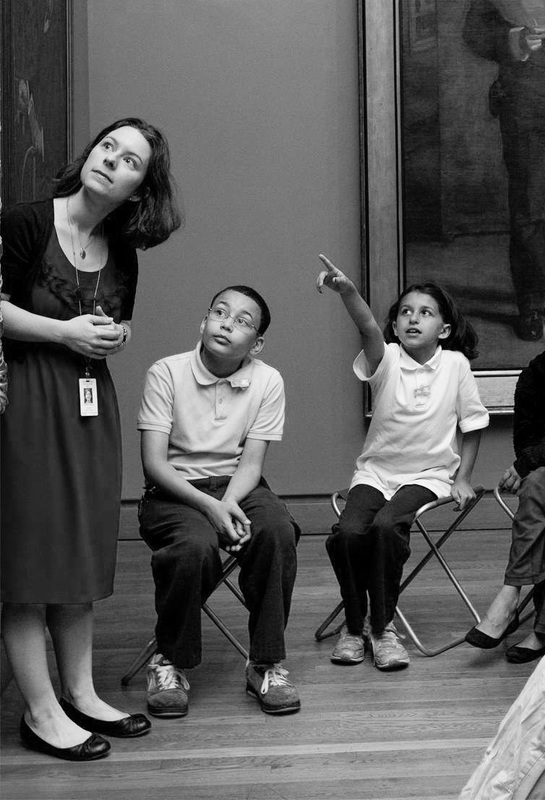 How can the excitement around the potential of the arts to contribute to STEM education, along with current research on spatial ability be shared in an art museum setting, so that PreK-12 teachers can bring the ideas into their classrooms? 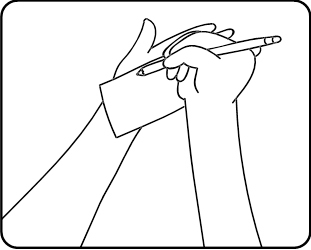 Here we’ll share the activities and discussions that we designed with this aim. 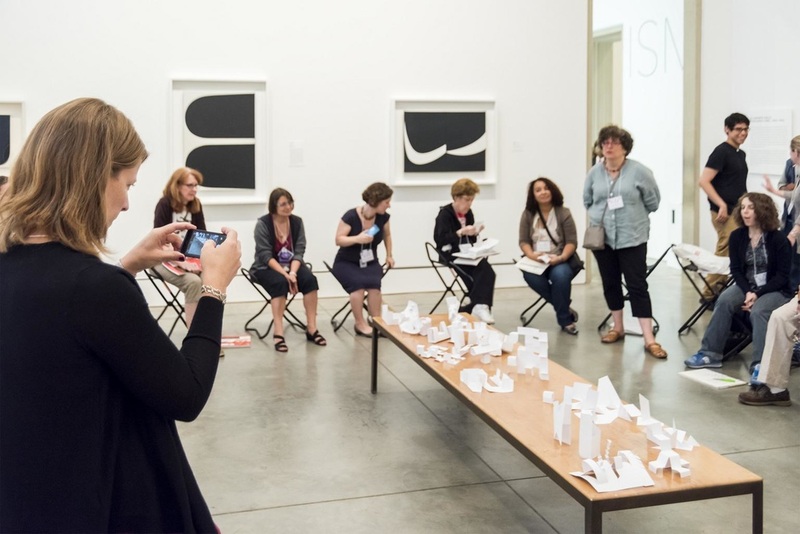 The two-hour gallery session was a part of a week-long teacher institute, VAST (Visual Arts and Sources for Teaching) held at the Philadelphia Museum of Art this past July. The overall theme for VAST was integrating art across the curriculum. Our session was led by Andrea Kantrowitz, Assistant Professor at Tyler School of Art, Temple University, who co-wrote and implemented the Framing Student Success curriculum; Rebecca Mitchell, former Manager of Teacher Services at the Philadelphia Museum of Art; and Lynda O’Leary, Distance Learning Coordinator at PMA. Through a series of structured activities (individual, small group, and large group) – looking at art, drawing, creating sculptures, discussing, and choreographing a short dance on a work of art (yes, you read that right! ), the teachers engaged their spatial thinking skills to think and create in two- and three- and even four- dimensions. After a short introduction to the Framing Student Success study and some research findings about spatial thinking, the teachers began their first activity. 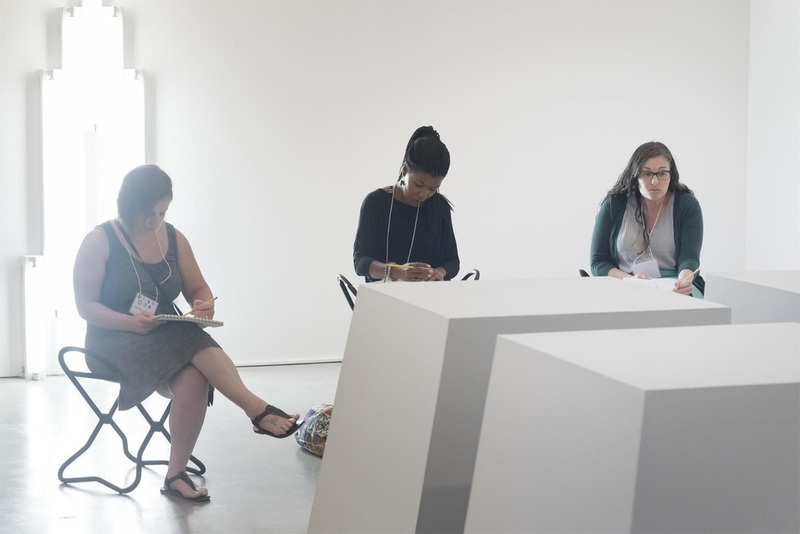 With pencils and sketchbooks in hand, the group spent 10-15 minutes drawing Robert Morris’s Untitled (Battered Cubes) from 1970, a piece made up of four large cube-like objects. Andrea explained that there was no “wrong” way to draw the sculptures, and that a variety of approaches would be beneficial to our discussion later. Since there were art teachers and classroom teachers in each group, we didn’t want anyone to feel self-conscious about their drawing ability. Andrea emphasized that it was the thinking and problem solving that was most important, not how “accurate” the drawing looked. The teachers sat wherever they felt comfortable, and drew the sculpture from whatever angle they preferred. The teachers then watched a minimalist dance performance, choreographed by Lucinda Childs and filmed by Babette Mangolte in 1973, Calico Mingling (available here: http://ubuweb.com/film/mangolte_calico.html) and notated it however they wanted to – through sketches, notes, or some combination of the two. Again, the goal was to observe closely and record these observations with pencil and paper. In the Childs piece, the dancers move around and through a grid pattern on the ground, located at Robert Moses Plaza at Fordham University. We gathered the teachers back together and placed the drawings of the sculpture on the floor. 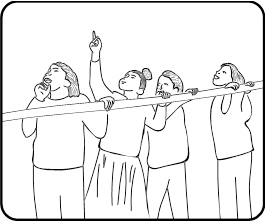 After a walk around the circle to look at all of them, we discussed the variety of approaches – while some people showed multiple viewpoints in one drawing, others focused on what they could see from their vantage point. 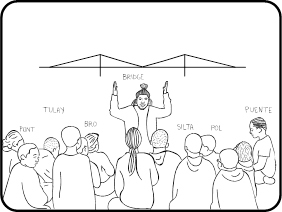 Next we looked at everyone’s notes/sketches of the dance, which revealed even more variety. Some people focused on one dancer’s movements, while others watched for overall patterns among all of the dancers. Still others counted steps, traced arcs of the movements, or looked for relationships between the dances and the grid below their feet. All of these approaches yielded successful results, and the variety of solutions enriched the group’s understanding of both the sculpture and dance. We discussed the challenges and strategies to translate three-dimensional objects onto a two-dimensional surface, and the added complexity of movement and time. Now it was time to experiment with creating something three-dimensional from a two-dimensional material: paper. Working with a 1 1/2 inch dot grid on an 8 1/2 x 11 sheet of paper, a pair of scissors, and small circular stickers, teachers created sculptures. No specific instructions were given except to create something three-dimensional based on the grid. The teachers cut, folded, and taped. Discoveries were made, and sculptures were adjusted. They learned what worked and responded to their new knowledge as they continued to build. 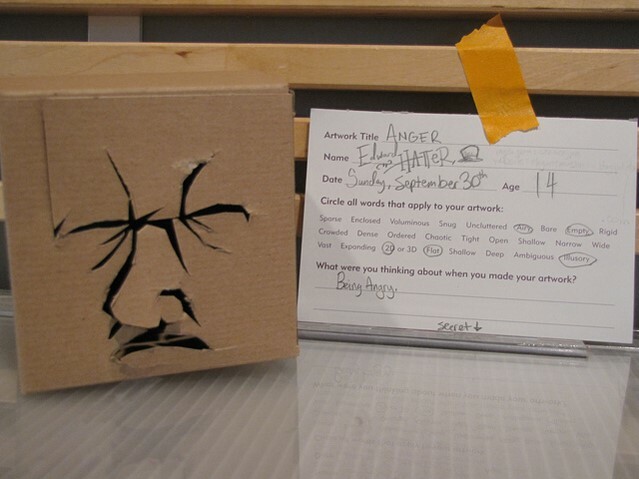 As expected, this exercise resulted in a wide range of sculptures – size, shape, and orientation. We displayed the sculptures in the center of the room and discussed the process and results. Some moved in grid-like movements: forward, backward, side-to-side, while others incorporated more organic movements. Some were in unison, others had each dancer moving in a unique way. All utilized the length of the sculpture and responded to its structure. On a concluding walk through the galleries, we took note of how artists throughout time and place use the grid to organize space. 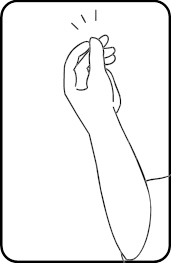 For example, the use of one-point perspective in a Canaletto painting or the incorporation of multiple perspectives in an 18th century Japanese screen. From grids on floors, to decorations on the ceilings, to paintings, drawings, decorative arts, and sculptures on view, it became clear that grids abound in art and architecture. We began to consider the world around us in new ways and recognize underlying structures that order our built environment. 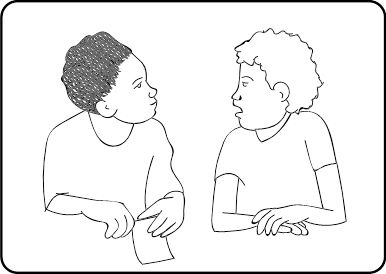 These exercises drew the teachers out of their comfort zones and encouraged them to engage in creative play – looking, drawing, creating, dancing, and discussing. They considered spatial relationships from several perspectives and through different means. It is our hope that the teachers left the session with practical ideas for the classroom, an enriched understanding of spatial intelligence, and a new appreciation the interconnectedness of art across the disciplines. 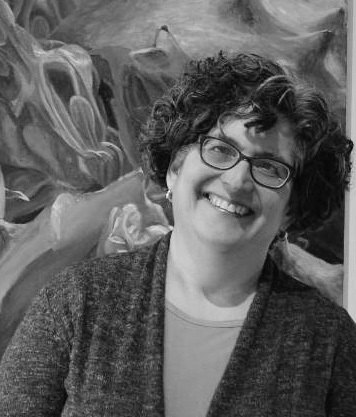 ANDREA KANTROWITZ, EdD, is an artist and researcher, who has lectured and given workshops internationally on art and cognition. As the director of the Thinking through Drawing Project at Teachers College, Columbia University, she organized a series of international drawing and cognition research symposia, in collaboration with colleagues from the U.K. She holds a B.A in Art and Cognition from Harvard University and a MFA in Painting from Yale, and an Ed.D from Columbia University in art education and cognitive studies. 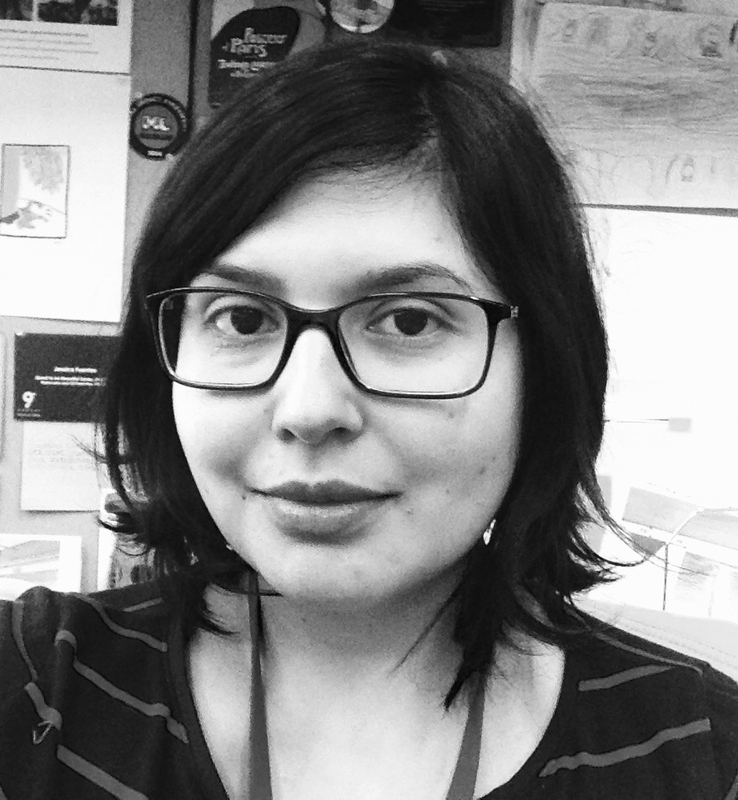 She teaches foundation drawing at Pratt Institute in Brooklyn, and art education at Tyler School of Art, Temple University. She worked for many years as a teaching artist in the New York City public schools and has been involved in multiple local and national arts in education research projects. Her own art work is represented by Kenise Barnes Fine Art. Inspired by the Museum Ed Mashup in New Orleans, Cleveland hosted the first Ohio Museum Teaching Mashup at MOCA Cleveland on August 10. Hosts from a cross-museum team (Nicole Ledinek from MOCA, Gina Thomas McGee from Akron Art Museum, and Bethany Corriveau Gotschall, Patty Edmonson, and Hajnal Eppley from the Cleveland Museum of Art) planned a day-long event with multiple rounds of gallery experimentation and discussion. As hosts, we were excited about working together and were energized by the planning process, but we weren’t sure how successful this event would be in terms of attendance. Previous mash-ups and throw-downs in New Orleans, Denver, and New York took place when educators were already close geographically, or gathered for an event. Would people from other cities really want to travel all the way to Cleveland for this mashup? 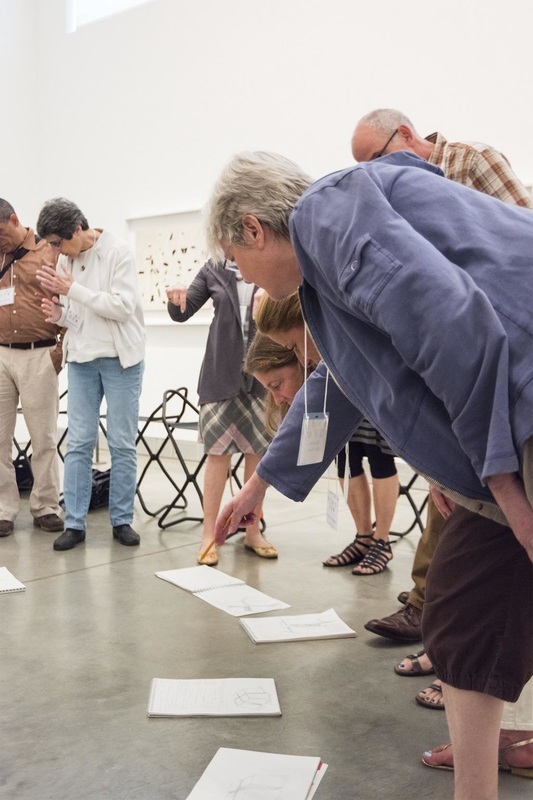 The answer was a resounding, “Yes!” Forty museum and university educators, classroom teachers, and volunteers from cities such as Cleveland, Columbus, Toledo, Cincinnati, Dayton, and Detroit joined together to experiment, share ideas, and play in MOCA Cleveland’s galleries. Hosts and participants commented that one of the most important components of the event was the opportunity to meet new colleagues and collaborate. 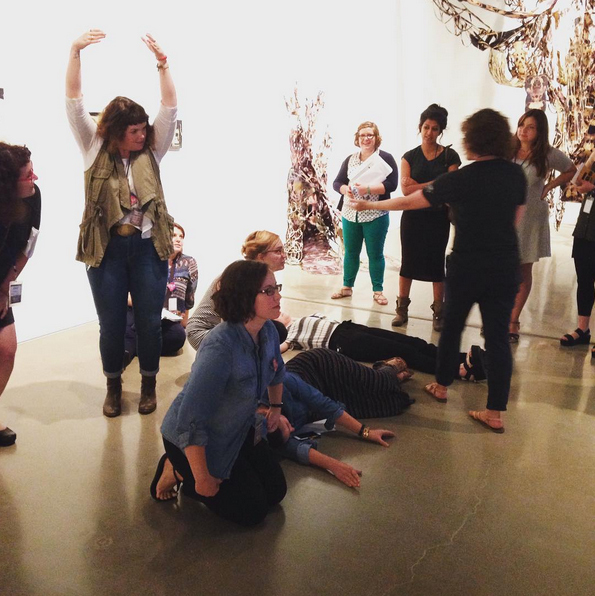 While some larger cities host frequent regional museum education or art education professional development, many of us in Midwestern museums have not had these opportunities. Several participants commented that they were unable to attend conferences and, particularly for those in smaller institutions, they sometimes felt a sense of isolation. For many of us, this event was the first opportunity to meet colleagues in the region and lay the groundwork for future collaborations. We divided the day into two experimenting sessions, modeled after the New Orleans experience. After a quick introduction in the morning, randomly-drawn groups of three received an artwork and planned their experience in 45 minutes. 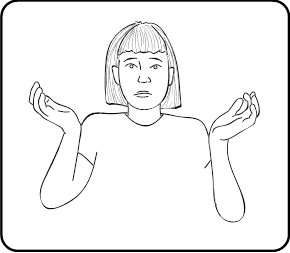 “I found that I was easily able to let go of the desire to understand where they [fellow experimenters] came from and what strengths they brought to the table, instead focusing on working together with whoever happened to be in my group to develop an experience. 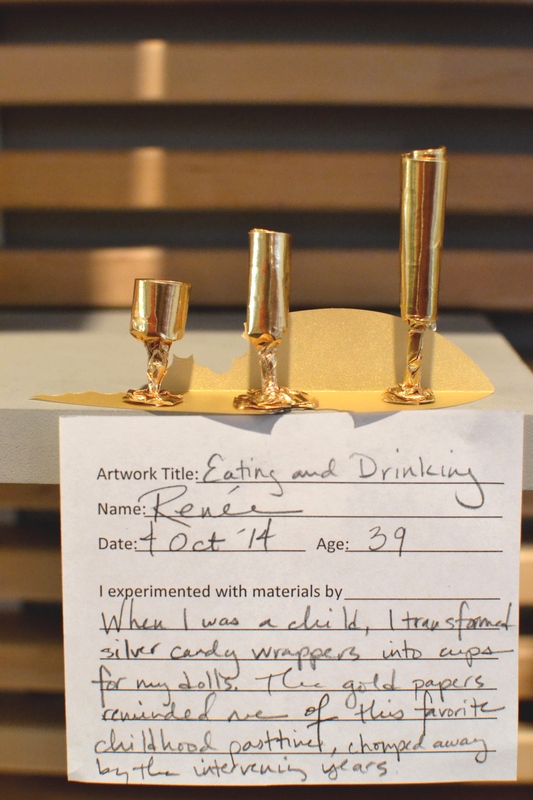 I’ve been thinking about how that kind of experience is particularly useful in understanding how to approach collaborative work, compromise, and flexibility at my home institution,” reflected one of our experimenters. Because this was the first regional gallery teaching experiment and we knew we were asking some participants to step out of their comfort zones, we wanted to provide an opportunity for reluctant participants to observe first, and join the experimentation later in the day if they felt inspired. After lunch we repeated the format of the morning with a shorter planning period. Groups devised experiences for us to embody art, create stories, explore process, and look in refreshing ways. One gallery experience designed by Maria Iafelice (Toledo), Kate Blake (Toledo), and Joan Kohn (Cleveland) involved the architecture of the MOCA building, designed by Farshid Moussavi. 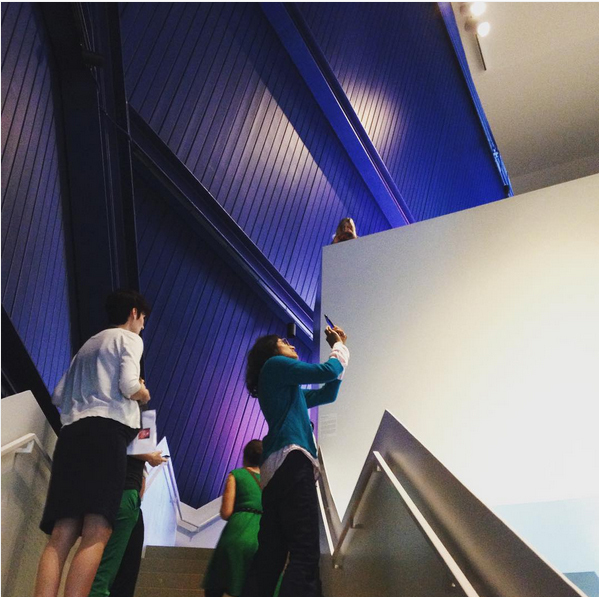 Experimenters asked participants to share words they would use to describe a stairwell and then use their phones take pictures of various perspectives of the stairwell as they climbed. At the top, participants were asked to pull up one of the photos they took and physically place their phones together where their photos connected. The result was a participant-generated photo collage inspired by the space surrounding us. The format for this event was not brand new. The experiences and discussions we completed together may not all have been radical, trail-blazing gallery experimentation, but this was not the goal. For Midwestern museum and art educators, this event felt like a true beginning to the building of our professional community. Unknown individual plays the piano on site at the Portland Art Museum. Photo by Benji Vurong. As a museum educator, I enjoy the elements of random surprise and creative disruption that can creep into museum practice. Experiencing the unexpected, especially in the space of a museum, can be such a rewarding thing. Back in late July, I had such an experience here at my own museum as I walked up one morning for work and heard a piano playing … and it was coming from the Museum’s outdoor sculpture courtyard. As I rounded the corner, I was surprised to see a piano sitting right there outside the Museum. The person playing the piano was truly fantastic, and a small group of people had gathered to listen — I assume that most were walking across downtown when they were drawn in by the sound of the piano. I sat with the group for about 10 minutes, and then headed to my office with a few questions burning in my head: “Why is there a piano here at the Museum?” “How could I learn more?” “Would there be any way to keep the piano here?” I was so intrigued by how much this simple piano could activate and transform this small, public urban space. McGeorge started the “Piano Push Play” project after experiencing “Play Me, I’m Yours” in New York City, a project developed by British artist Luke Jerram. According to his project’s website, Jerram’s street piano project has reached over three million people worldwide, with more than 800 pianos having been installed in 35 cities across the globe, from New York to London. Located in public parks, bus shelters and train stations, outside galleries and markets, and even on bridges and ferries, Jerram’s project makes pianos available for any member of the public to play and enjoy. Who plays them and how long they remain on the streets is up to each community. Many pianos are personalized and decorated by artists or the local community. 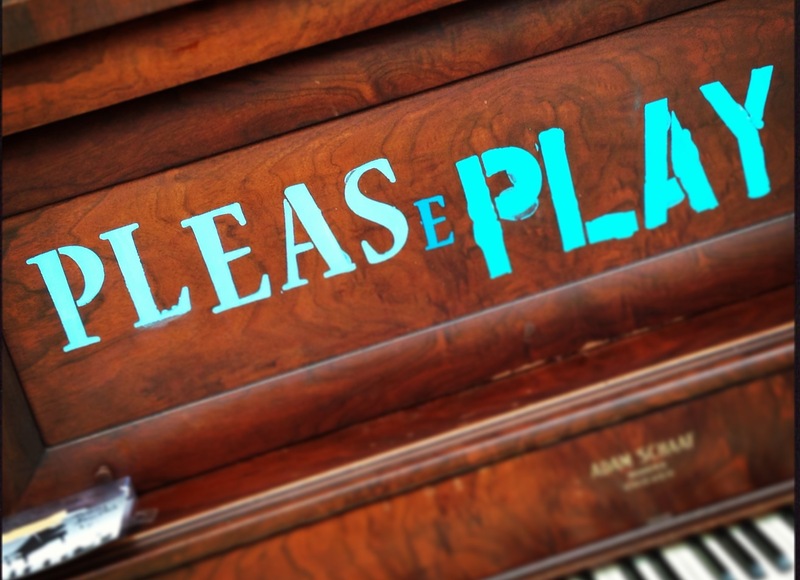 According to Jerram, by creating a place of exchange, “Play Me, I’m Yours” invites the public to engage with, activate, and take ownership of their urban environment. 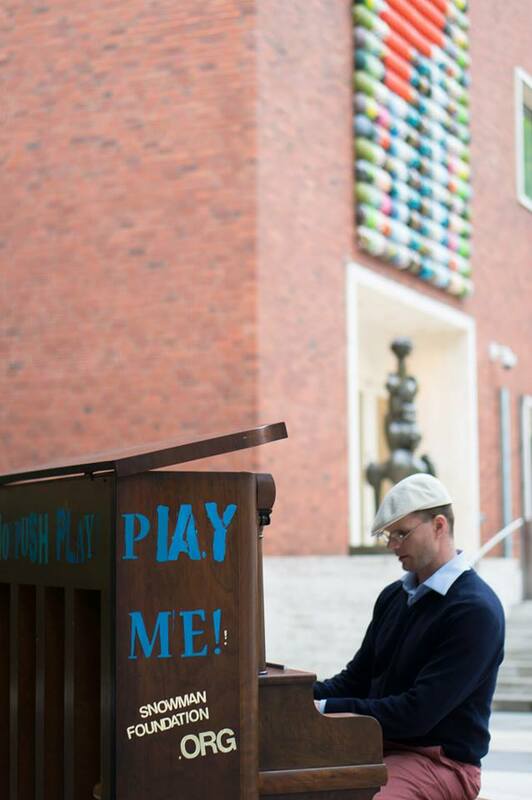 The Utah Museum of Contemporary Art also hosted “Play Me, I’m Yours” during 2 weeks in June 2012, with 10 pianos decorated by a series of Utah contemporary artists that were placed in public spaces across Salt Lake City including UMOCA. This summer, the Cleveland Museum of Art has jumped onto Jerram’s project — in conjunction with their celebration of the 2013 Cleveland International Piano Competition (CIPC) being held at the museum. 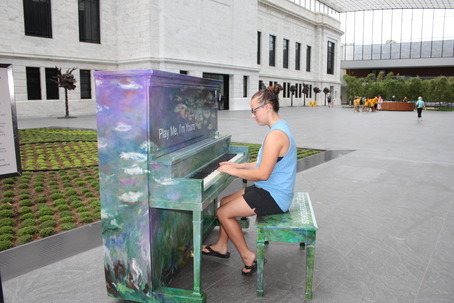 CIPC and Case Western Reserve University are presenting Play Me, I’m Yours Cleveland, which includes a piano decorated like the Cleveland Museum of Art’s Monet Water Lilies panel that was available to play through August 18, 2013. Later this fall, as part of celebrating the 75th season of Boston’s Celebrity Series, the organization has decided to partner with Jerram to bring this public street piano installation to Boston, including a piano sited at the Boston Museum of Fine Arts this fall from September 27 to October 14, 2013. These are just a few of the art museums that have decided to get involved with “Play Me, I’m Yours,” and I’m sure there are many other art museums connected to this project or hosting public pianos outside of Jerram’s network. Here at the Portland Art Museum, Megan McGeorge’s own “Piano Push Play” project has been drawing in lots of people in play, listen, interact with each other, and even learn about some of the organizations involved in expanding music education and access to instruments here in the Pacific Northwest. “We believe that simply by exposing people to the visual and auditory experience of a fellow human playing the piano, we are reminded of how magical and vital music is to our community,” says McGeorge, in a recent interview with OPB. “Thanks to a partnership with our organization, and our generous sponsors Portland Piano Company and West Coast Piano Moving and Storage, we are able to bring together the components of community, kids and music to the streets of Portland,” added Michael Allen Harrison, founder of The Snowman Foundation. On several Fridays since the piano was installed at the Portland Art Museum back in late July, there have been concerts with additional instruments and noteworthy performers (the best way to find updated information is on the “Piano Push Play” Facebook page — especially since a lot of the programming is of the ‘pop-up’ variety). But the best way to experience this project is just to walk by and experience the music, the people, and the energy of this space. 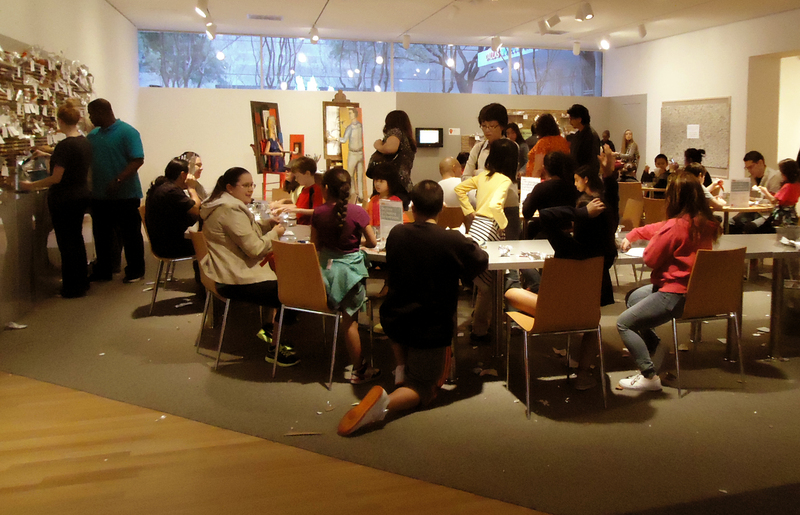 It is a great way for museums to continue to let go, to have community members creating and sharing artistic expressions, and to put community members at the center of a certain form of public engagement and programming. The pianos in these projects stay in location as long as the community can support it (in terms of the cost of tuning and any maintenance needed to keep it sounding good). Through the generosity of several individuals, the piano has remained at the Portland Art Museum for several weeks past its original 12-day time slot. If you are interested in further supporting this piano, you can go to their WePay.com site by clicking on this link and find more information there. Beyond simply having a public piano for people to play, this project intrigued me in terms of how it reactivated and energized the outdoor space between the buildings of the Portland Art Museum. And each time I stop by the piano, I am struck by the people gathered around, talking to each other and listening together. 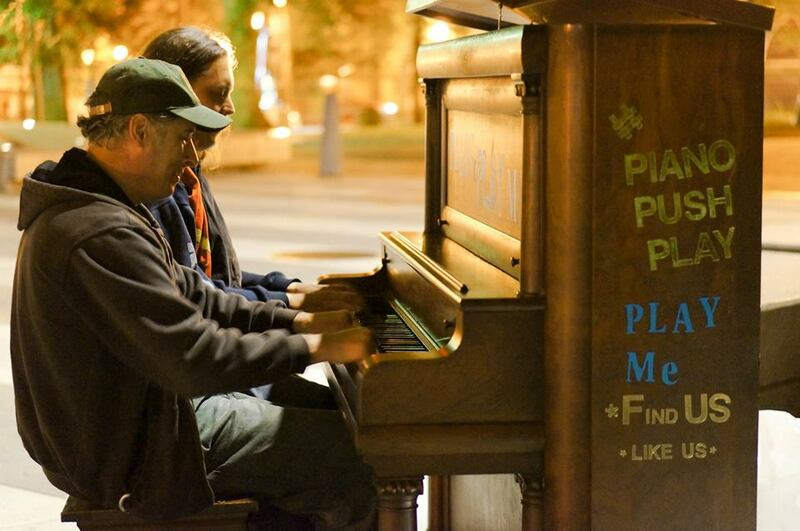 “Piano Push Play” certainly turns this public space into a site of exchange, where people meet who might never cross paths any other way in Portland. I spoke with Megan McGeorge recently about this project, and she mentioned the powerful social and community-building element of street pianos. McGeorge, who plays at the piano herself fairly regularly, remarked, “I’ve met so many people I would have not met otherwise; playing is a great way to start a conversation.” One of the photos she shared with me (below) shows two strangers named “Safety Jack” and JB. They had never met before, but came to this piano and were teaching one another songs that they each knew. Two strangers meet and share songs at the Portland Art Museum. Photo by Benji Vurong. Do others’ have experience with public or street music projects like this in conjunction with a museum? Is this type of project relevant to the work of museums? 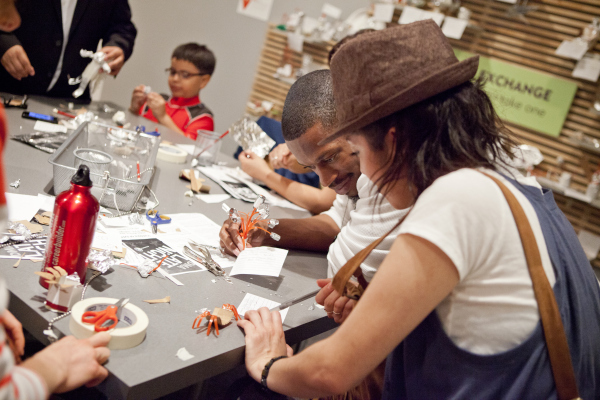 How might museums play a stronger role in community-based projects like this that bring people together around arts and creativity? What would a similar project look like in the visual arts? As always, I welcome your feedback, thoughts, and comments. And perhaps you will have the opportunity to participate in “Play Me I’m Yours” or “Piano Push Play” here in Portland or in your own city. PLEASE play!